Womensphere celebrates and promotes the spirit of generosity, giving, and philanthropy. At this year's Inaugural Womensphere Festival, we have chosen to support and promote the following outstanding non-profit organizations and social enterprises started by/led by women, and/or benefiting women and girls. Shops, restaurants, and participants taking part in the Womensphere Festival and Summit are invited to support and advance these worthy causes and great leaders. Advancement for Rural Kids (ARK) empowers farmers in the developing world to feed and keep their kids in school. With its groundbreaking $15/kid/year Feeding Program, ARK and its partner communities are successfully eradicating hunger, getting kids back to school, and providing new income and industry to rural communities. This paves the way for and makes ARK's $5/kid/year Supplies, $50/kid/year Scholarship, Classrooms and For-Profit investments successful and sustainable. Ayesha Vera-Yu is the CEO & Co-Founder of ARK. Ayesha had worked at BNP Paribas, where she was a senior leader in the bank’s leverage finance, acquisition finance, and debt syndications activities. Ayesha received an MBA from Columbia University’s Executive Program and a BA in Biology and Chemistry from Mount Holyoke College. Ayesha co-founded ARK with her husband Jerry Topitzer, a banker at JPMorgan. She is a Young Global Leader at the World Economic Forum. Girls Inc. inspires all girls to be strong, smart, and bold, providing more than 138,000 girls across the U.S. and Canada with life-changing experiences and real solutions to the unique issues girls face. Girls Inc. gives girls the right tools and support to succeed, including trained professionals who mentor and guide them in a safe, girls-only environment, peers who share their drive and aspirations, and research-based programming. Judy Vredenburgh is President and CEO of Girls Inc. since 2010. Prior to that, she also served as President and CEO of Big Brothers Big Sisters of America and SVP of Revenue Development and Marketing at the March of Dimes Birth Defects Foundation. Judy holds a BA from the University of Pennsylvania and an MBA from the State University of New York, Buffalo. She holds honorary degrees from Lynchburg College and Philadelphia University. The Global Fund for Widows assists its widows by creating employment opportunities where no other opportunity exists. The Global Fund for Widows seeks to align a widow's skills, abilities, interests and financial needs, with employment options created by the program or through partnerships with other organizations and employers. With financial stability, widows are inspired to become self-reliant and self-accountable. And, in this way, they are able to extricate themselves from poverty. Heather Ibrahim-Leathers (CEO) co-ounded the Global Fund for Widows together with her friend Elaine Barsoom, following the passing of her grandmother in 2009. Past work experiences include Credit Suisse and JPMorgan. She earned her Bachelors in Economics from the Wharton School at the University of Pennsylvania. The Global Fund for Women is a publicly supported, nonprofit grantmaking foundation that advances women's human rights by funding women-led organizations worldwide. We provide general operating support grants to organizations working at the local, regional and national levels to enable women and girls to reach their potential and live free of discrimination and violence. Musimbi Kanyoro is the CEO and President of the Global Fund for Women since August 2011. Born in Migori county, Kenya, she earned an undergraduate degree from the University of Nairobi and a PhD in linguistics from the University of Texas, Austin. For her second doctorate, Kanyoro studied feminist theology at the San Francisco Theological Seminary. She received three honorary doctorate degrees. The New York Women’s Foundation is a voice for women and a force for change. They are a cross-cultural alliance of women catalyzing partnerships and leveraging human and financial capital to achieve sustained economic security and justice for women and girls. With fierce determination, they mobilize hearts, minds and resources to create an equitable and just future for women, families and communities in New York City. Ana Oliveira is the president and CEO of The New York Women's Foundation. For more than 20 years, she has been a staunch defender of human rights, developing programs for vulnerable populations throughout New York City. She is also the first female and Latino executive director of Gay Men's Health Crisis, expanded services for women, Latinos, and African-Americans affected by HIV and AIDS. Shining Hope for Communities (SHOFCO) combats gender inequality and extreme poverty in urban slums by linking tuition free schools for girls to holistic social services for all. The SHOFCO model is centered around a school that provides a superior education with free healthcare, food, and psychosocial services. The school gives students the support they need to complete their education and the tools to find a path out of poverty for themselves and their families. Kennedy Odede, Co-Founder and CEO of SHOFCO, is one of Africa’s best-known community organizers and social entrepreneurs. Kennedy founded SHOFCO with his wife Jessica. He was raised in Kibera, the largest urban slum in Africa, where he experienced the devastating realities of life in extreme poverty. He received a full-scholarship to Wesleyan University and graduated in 2012 with honors in Sociology. He splits his time between Nairobi and New York City. The Women's Refugee Commission is an expert resource and advocacy organization that monitors the care and protection of refugee women and children. They speak out on issues of concern to refugee and displaced women, children and adolescents, who have a critical perspective in bringing about change but often do not have access to governments and policy makers. Sarah Costa, Executive Director of the Women's Refugee Commission, has more than 25 years of experience in the fields of women's rights, reproductive health, gender and youth development, as well as global philanthropy. Sarah was born and raised in England, where she earned a Master's Degree in Demography from London University and a Ph.D. in Social Medicine from Oxford University. She has published numerous papers and articles on women's health and reproductive rights in both English and Portuguese. HeForShe is a campaign led by UN Women in which men all over the world are being encouraged to speak out against the inequalities faced by women and girls. 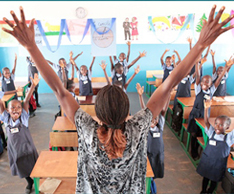 The Global Teacher Prize is an annual one million dollar award from the Varkey GEMS Foundation to be given to a super-special teacher. One innovative and caring teacher who has made an inspirational impact on their students and their community will receive the reward of a lifetime.